You can depend on our repair team for the finest service, friendliest technicians, and the most affordable prices in Santee. Check out some of our most recent projects by looking below and give our specialists a call for the best garage door service in town! Customer Issue: This customer’s panel had a crack in it from the car bumping into it. Our Solution: Our experts found the perfect size and color of panel to replace the damaged one with so there would be no noticeable difference. 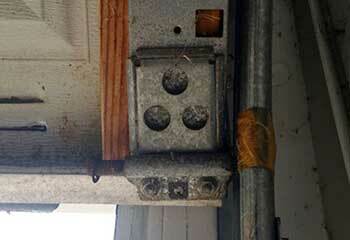 After unscrewing the cracked panel to remove it from the door, the new panel was installed securely into place. Our Solution: This customer nearly got injured after her door suddenly dropped and started leaning to one side. It was immediately clear to us that the left lift cable broke. We quickly replaced it and the second unit (it was too frayed to stay functional) and then made sure the door could rise and lower smoothly and safely. 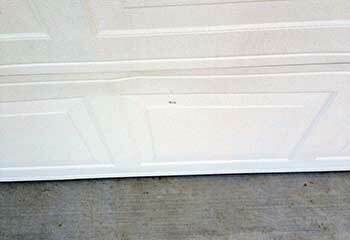 Customer Issue: Garage door makes a lot of noise. Our Solution: There were a few possible causes for this customer's problem. As it turns out, pretty much all of them were present. We lubricated the torsion spring and the steel rollers, repaired some minor bending in the tracks and replaced the opener's motor gear, which had become significantly worn. When we were finished, the door was nearly silent. Customer Issue: Interested in increasing the security of his home. 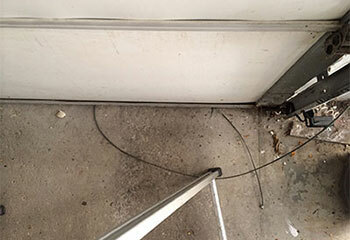 Our Solution: We got a call from Mr. Gordovsky, who was looking for a powerful garage door that would offer him an added sense of security. 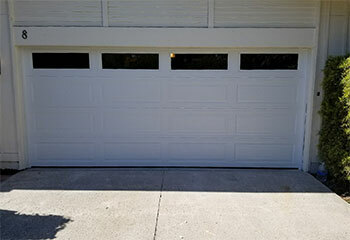 We made several recommendations, and he decided to get a Clopay garage door from their Modern Steel™ collection, which we installed a few days later. The customer was incredibly happy with the impressive look and durability of his new door.